I love it when someone takes a neat concept and packages it up in a beautiful form, which is exactly what Andreas Ehnbom has done with Fuji Leaves. This is a downright gorgeous interactive music app, and the screenshots almost do it a disservice, because this is really an app you want to see in action. It’s rare to find an app that has such a serenely organic and simple quality. Instead of ominous blinking countdowns and industrial-strength mazes, you get a handful leaves and rocks. Choose between night and day settings, and then you can position the leaves and rocks so that whenever a rock bounces against a leaf, it makes a sound. Adjust their size, angle, and position, maybe add a few more rocks, and you’ve created music, a rich forest symphony of sight and sound. And, goodness, are those sound effects lovely. The music is a bit on the repetitive side, but it’s the intricate patterns you can build that make this app so compelling. You can affect the pitch by adjusting the velocity of the rocks, and the sound of the leaf changes the more you use it. Although it takes a little practice before you get really good at lining everything up, the whole process of making the music is profoundly satisfying. The visuals are also absolutely superb: a delicate combination of watercolor painting and kinetic sculpture. Besides the rocks and leaves, the backgrounds are lovely, with dynamic details like gentle animated water and fireflies adding to the atmosphere. In truth, all of this loveliness would have been stopped dead in the water if the interface couldn’t rise to the challenge, but I found it to be smooth and easy to work it. The tutorial makes the learning curve very easy, and since Fuji Leaves has no real objective other than to let you create pretty music, you have all the time in the world to mess around with it at your own pace. There’s not a huge amount of content in Fuji Leaves, but it gives you some truly magnificent tools to make your own. Gentle, luminous, and wonderfully relaxing, Fuji Leaves is a little pool of tranquility for the iPod generation. 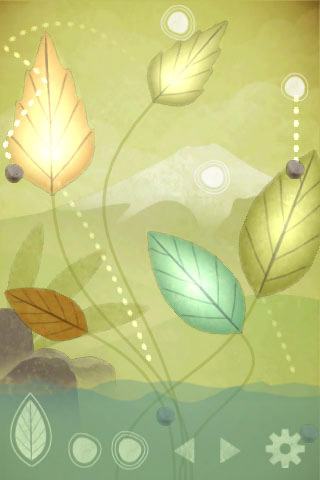 AppSafari review of Fuji Leaves was written by Tracy Yonemoto on April 15th, 2010 and categorized under App Store, Featured, Fun, Games, Music, Music. Page viewed 3975 times, 2 so far today. Need help on using these apps? Please read the Help Page.